I continue to find ways to organize my “new” studio space. So, I thought I’d share one of my newest projects. This old 27.5″ X 40″ frame has been kicking around for a good many years now and has been a great bulletin board, a memo board, and sandwich board (with it’s partner). As my button collection seems to reproduce when I’m not looking, I thought I’d use up some of them and decorate my old, tired frame. Step 1: I sanded and primed the entire frame. Measured a nice piece of peg board and primed that as well. Step 2: Paint the frame. I used a nice green to coordinate with my studio colors and painted the pegboard one shade lighter. Step 3: Now is the time for some button fun! 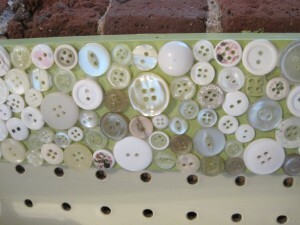 Use any old buttons you have lying around. I used all clear or white for a kind of “sparkly” appearance. I used white school glue to attach mine. Let it dry at least overnight. Step 4: Attach peg board to the back of the frame. This will depend on your frame and how it’s constructed. If it sits flat against the wall, you’ll want to attach a couple of spacers to bring it out from the wall a bit in order to use peg board hangers like I did. And, voila! A gorgeous new piece of organizational art!! What size frame will you use? What will you use it for? I’d love to hear about your ideas!